I remember vividly the feeling I had when I realized I was really going to do this -- that I was really going to build my own home arcade cabinet! I didn’t really have any idea of how I was going to get there, but I knew that if others could do it, then I could, too. All I needed to do was pick my goal, plan out the steps, buy a few things, and then I’d have my own arcade cabinet. Nothing to it, right? Well, of course, there were a few minor details along the way, like actually building the thing. Still, after dreaming about it for well over a year, there I was, finally getting started! Now it’s your turn. I’ll walk you through the process from beginning to end, starting with goal setting and planning in this chapter. Are you ready? I almost envy you for just starting the book -- for you, the magic is just beginning! The hardest part of any project is deciding where to start. It's tempting to jump right in and start hammering and sawing, but a bit of homework now will pay off in the end. Before you start on your own project, you should devote some time to browsing the examples of those who have gone before you. At the time of this writing, there are over 775 examples of arcade projects listed on the Build Your Own Arcade Controls Web site (also known as BYOAC) and on the companion CD-ROM for you to see. It's a fact of life on the Internet that very little stays the same. By the time this book makes it into your hands, many of the project examples included on the CD-ROM will have been updated, and many more will have been added. Be sure to visit the examples page on the Arcade Controls Web site, located at www.arcadecontrols.com/, for the latest and greatest! Some projects are works of art, and some only a parent could love, but all have one thing in common: Each was lovingly put together by its creator and might have a feature or two you wouldn’t have thought of and won’t be able to live without once you’ve seen it. The bar has been raised many times during the five years I’ve been involved in this hobby. It’s unusual to have a month go by without some project inspiring me to bigger and better things in my own endeavors. As meaningful as every project is to its owner, in every field there are those examples that stand out from the rest. In Chapter 18 you’ll find several arcade cabinet and desktop arcade control projects to inspire you. Although it’s worthwhile to browse all the example projects available, doing so can literally take days! If you’re looking to fast-track the inspiration process, skip ahead to Chapter 18 and read through those. Now would be a good time to get out a notebook and start jotting down ideas as they come to you during this process. The number of possibilities in this kind of project can be overwhelming, so good organization from the start will help. Be sure to include the address of any project’s Web site that you make note of. When it comes time to implement the ideas from your notes, you’ll want to be able to quickly find the site again to check up on the finer details. By now you’re probably beginning to realize that there is no one model of what an arcade machine is. As you browse through other people’s projects, you’ll encounter upright arcade cabinets, sit-down cocktail cabinets, desktop arcade control panels, and contraptions that defy description. How do you decide where to begin? I’ll describe each of these in the sections that follow, including pictures to help you make some decisions. Start by asking yourself the questions found in Table 1-1. Are you looking to recapture the full arcade experience? Nothing brings you back to the arcade like a full-sized upright arcade cabinet. Want the arcade experience but need a spouse’s approval? Consider a sit-down cocktail cabinet that doubles as a piece of fine furniture. OK, I admit calling it fine furniture may be a stretch, but a cocktail cabinet can blend into the decor nicely. Do you have the time, skills, and patience to build a full cabinet? If not, a desktop arcade control panel may be for you. They are comparatively small and not too difficult to make. Do you want to start small and work your way up? Start with a desktop control panel that can be incorporated into an upright cabinet later. Is space at a premium? With a little ingenuity, you can make a counter-top arcade cabinet like those you’d find at a tavern. Do you just want to plug in a game console controller and start blasting away? For about $30, you can build an interface that will allow you to hook up your favorite controller to your computer. Take a few minutes to assess your personal situation. Do you have a limited amount of time to devote to the project, or are you in it for the long haul? Where will you put your creation when completed? Be thinking of considerations such as these and the questions in Table 1-1 as you go over your project options. A desktop arcade controller takes the control panel from an arcade machine and adds a box around it to hold it and protect the insides (see Figure 1-1). The top panel holds the joysticks, buttons, and other arcade controls. Inside the box are the underside of the controls and the electronics needed to interface the controls to the computer. The back of the control panel has a hole or holes for the cables that hook into the computer. 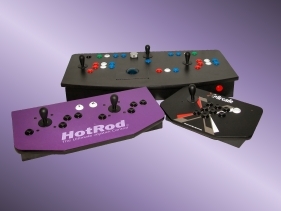 Figure 1-1: Several commercial desktop arcade controllers. Photos courtesy of Hanaho Games, SlikStik, and Xgaming, Inc. respectively. What are the benefits of a desktop arcade controller? Building a desktop arcade controller is a good project for those with a more casual interest in game playing. You get the benefits of playing with real arcade controls, without having to lose floor space in the house. I keep a small one-player unit on my desk for when I get that gaming bug, and I slide it out of the way when I want to work. Not only do desktop arcades save space, but you also do not have to dedicate an entire computer system for game playing. They are also portable for those times when you visit arcade-deprived friends. Warning! Visiting friends with your contraption or letting them play at your house can have one side effect: Shortly after playing, the question “How can I get one of these?” will come up. This is your cue to direct them to where they can purchase a copy of this book. By no means should you allow them to borrow your copy. You will need it when you begin your next design! Desktop arcades are also easier to build than full-sized arcade cabinets, but they can still contain the same mixture of arcade controls. Although the design and layout work is the same, the woodworking is much simpler and you don’t have to worry about the audio and video systems. What are the drawbacks of a desktop arcade controller? Desktop arcade control setups have a couple of downsides. For one, you lose your desktop space. Wait -- wasn’t I just praising these units as a way to save space? Well, yes, but it’s relative. You’re not dedicating floor space, but you are giving up workspace. Even the smaller one-player units can measure a foot and a half wide by a foot deep, and the larger units can be 2 to 3 feet wide -- that’s a lot of desk space to give up! After the initial thrill of playing wears off, the realization will set in that you’re still in front of a computer screen. Playing a game with real arcade controls on your desktop is definitely fun, but it’s not quite an arcade cabinet. If you’re trying to recapture the feel of an arcade, you’ll want the arcade cabinet atmosphere as well as the controls. Don’t get me wrong -- I think a desktop set is a project worth building, and I believe I’ll always have one on my desk. It’s just no substitute for the real thing. Some arcade game collectors will scoff at calling a home-built arcade cabinet “the real thing.” There’s actually a bit of controversy on the subject, with valid points on both sides of the debate. You’ll find more on this topic in Appendix B. An arcade cabinet is essentially a box containing the monitor, speakers, arcade control panel, and miscellaneous electronics that make an arcade game work. In our case, the miscellaneous electronics include a computer that runs the whole operation. Many variations of arcade cabinets can be found. The following descriptions cover the most popular of them (see also Figure 1-2). 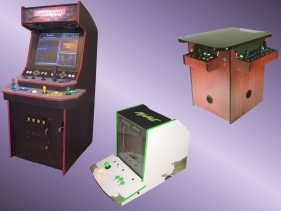 Figure 1-2: A few different arcade cabinets. From left: Upright, countertop, and cocktail. and Game Cabinets, Inc. respectively. You’re probably most familiar with the stand-up, upright arcade cabinet seen in arcades and convenience stores everywhere. They typically stand about 6 feet high and have 19- or 25-inch monitors, though later models can have much bigger monitors. These cabinets will support up to four players easily, depending on the design of your control panel. There is also a variation of the upright cabinet called a mini, which is a scaled-down version with a smaller monitor and cabinet that usually supports only one or two players. Roughly two-thirds of the build-your-own cabinets made are uprights. You’re likely to have spotted these machines also. They are popular in arcades, and for some reason pizza parlors tend to favor them as well. These units are about 4 feet by 4 feet square and about 3 feet high. The monitor rests in the middle of the cabinet face up with players looking down on it as they play. These cabinets are usually limited to two players sitting opposite each other and taking turns. About one-third of the build-your-own cabinets are cocktail cabinets. A cockpit arcade cabinet (not shown in Figure 1-2) is a full-sized enclosure with a seat included as part of the cabinet. There are fewer of these than the other types of cabinets made, presumably because of the sheer size. They are big, typically taking up the space of two or more upright arcade cabinets. These are usually one-player machines, though I have seen at least one two-player unit recently. I am aware of only a small number of cockpit cabinets that have been made by the build-your-own crowd. The last main variation of the arcade cabinet is the countertop, or bar-top, model. These machines are not much bigger than a set of desktop arcade controls, primarily being taller and deeper to house a small monitor. You will typically find these machines in taverns and bars, hence the name bar-top. They are most popular for trivia and puzzle games (like Tetris). Again, only a small handful of these cabinets are made by folks who try their hand at an arcade cabinet. What will you gain by building an arcade cabinet? Building an arcade cabinet has to be the most rewarding variation of this hobby you can find. It’s as close to the real thing as you can get without putting a full arcade into your basement. Depending on the type of cabinet you make, you can get a full-sized arcade control panel with genuine arcade controls custom designed for the type of game-play you’re after. Add a monitor shrouded in darkness that minimizes distractions and a moderate sound system, and you can immerse yourself in the arcade experience. There’s also plenty of space available to have such fancy things as removable steering wheels, sophisticated speaker systems, and four-player panels. You can also customize your software setup to hide the fact that the brain behind your arcade cabinet is a computer. With a combination of a front-end menu system and an arcade-themed background and sounds, it’s possible to completely disguise the non-arcade origins of your creation. Throw in a working coin door, and you’ll begin to believe you’re standing in front of a real arcade machine -- one that can play an unlimited number of games! I’ll go through all of this in later chapters. An arcade cabinet is also much easier to share with your friends, particularly if it has a two- or four-player control panel. Add music jukebox software (see Chapter 11, “Audio -- Silence Isn’t Golden”) and your legally obtained collection of music files, and you’ve got an entertainment centerpiece for your next party that will be the envy of your friends. If you have the time and resources, building an arcade cabinet is definitely the way to go! What are the drawbacks of an arcade cabinet? Building an arcade cabinet is more of an effort than building a desktop arcade controller. They are also more expensive, running anywhere from the $500 range for a small project to $1500 or more for the mother of all arcade machines. Arcade cabinets also tend to suffer from feature creep as they are being constructed, turning a simpler project into a mammoth (and more expensive) one. This may not necessarily be a bad thing, but it does tend to be wearing on your family members’ patience. Arcade cabinets can also occupy a significant amount of floor space, and unlike desktop arcade controls, they cannot be put away when not in use. They also require dedicating a computer system solely for their use in most cases, although a couple of folks have managed to make do with external laptops or shared computers. Assuming you’ll be dedicating a computer to the project, you’ll need to factor in the cost of any computer components you need to buy for the cabinet. If you’ve owned a computer for a while, the odds are that you’ve upgraded at some point and have an older computer lying around. These computers make excellent starting points for arcade cabinet projects. They will limit you to somewhat older games because of hardware requirements, but there are still hundreds of games that are great additions to an arcade cabinet. Using an old computer also makes an excellent bargaining point when trying to convince a reluctant spouse. You can always upgrade computer parts once the cabinet is built. The smaller shops tend to come and go, although a few have stood the test of time. These vendors are usually much more willing to customize their products to your design than are the larger operations. They also tend to offer better customer support, because the person you contact for assistance may also be the person who built your product in the first place. They tend to have slower shipping times, however, due to the realities of being a smaller operation, and are often more expensive. The larger operations have the benefit of mass production, financing, and a distribution infrastructure such that they can get their products to you faster than the smaller vendors. Their product lines are fixed, however, and they are less likely to be willing to customize a solution for you. At least one large vendor has been known to do customizations, so it never hurts to ask. Support from a larger company can be hit or miss, with some vendors providing faster and better support than others. Pricing should also be lower from a larger vendor. What do you gain by buying? If you’ve got the money, but not the time or patience to build your own, buying a pre-made product can be a great solution. You’ll get a professionally made piece of gaming equipment that’s attractive and comes with a warranty. If it stops working, there is someone you can go to who’s responsible for getting you back in business. Depending on your access to tools, and factoring in what your time is worth, it may actually be cheaper to purchase rather than build your dream arcade machine. What do you lose by buying? Although it can be less expensive to buy rather than build, that’s not often the case. If you already have access to the tools needed, and have the available spare time, you will probably find it cheaper to build rather than buy. There’s also the flexibility of being able to customize every facet of your design. Finally, there’s a level of satisfaction at being able to say “I built it!” that you obviously won’t get with a purchased product. If you decide to buy rather than build, take some time to do a bit of research first. Log on to the Build Your Own Arcade Controls message forums (www.arcadecontrols.com/) and the alt.games.mame newsgroup (http://groups.google.com/groups?q=group:alt.games.mame) and ask for opinions on any products you are considering. Also, pay with credit card if you can, and insist that your card not be charged until the product is shipped. Although we try to keep the Build Your Own Arcade Controls message forums family friendly, an occasional bad apple can slip through. Also, the alt.games.mame newsgroup is an unmoderated Internet newsgroup that is not owned by anyone, meaning people are free to speak their mind as they see fit. You get straightforward opinions, but the language can be colorful at times. Take a moment to stop now and think about what we’ve covered so far. If you’re planning to jump right in, you should try to make some decisions based on the above material and narrow the scope of what you’re attempting to create. Do you know what type of project you want to undertake? Have you assessed the time and money you can devote to the project? Are you going to build or buy? As you begin to pick a plan, buy materials, and lay out your designs, you’ll begin to limit the number of changes you can make midstream. By no means is change impossible, but it does become inconvenient in terms of time and expense. If you’re planning to read the book through first and then begin your project, you can safely postpone thinking at this point! So where do you go from here? As a friend of mine is fond of saying, “Proper planning prevents poor performance!” You need to make a few decisions before you proceed. There’s a bit of the chicken-and-egg syndrome coming up. It’s hard to make planning decisions without knowing more about the various options available, but I’ve tried to gear this book toward your being able to jump right in without having to read it through first. In the next few paragraphs, I’ll point you toward later chapters for additional information or inspiration for planning purposes. However, if you’ll trust me, there’s already a plan in place over the course of the book. When all’s said and done, you’ll end up with a nice two-player upright cabinet ready to play. If that’s the route for you, you can skim over the next piece and then jump in to Chapter 2. At this point I hope you have a general concept in mind for the kind of arcade machine you want. This would be a good time to consider the build-or-buy decision. You may wish to skip ahead to Chapter 17 to browse through the various commercial offerings to see if one of them will fit the bill. Don’t forget to factor the costs of buying against the time and costs of building. I’ll go over the various controls and interfaces in detail in Chapters 3 through 10. Still, you should be able to make some preliminary choices now. How many players do you want your cabinet to support? If you’re just starting out, a two-player cabinet is probably your best bet. However, if you have a favorite four-player game (and three friends who you know will come play), then a four-player cabinet might be your goal. You don’t really need to make any decisions regarding the interface just yet, other than planning to leave some space in your control panel for it. Figure about a 4-inch by 6-inch area inside the control panel for the interface. An interface in this case consists of the electronics or other device used to connect the arcade controls to the computer -- something that translates the signal that the arcade controls generate to something the computer understands. This topic is covered in detail in Chapters 7 through 10. Most of this area can be left until much later in the building process. However, at this point you need to take into account a few considerations that can make a difference in how you proceed. If you want to play a particular game, think about the kind of controls it may require. For instance, if the newly re-released Centipede is your cup of tea, you’ll need to plan for a trackball. The majority of games will run fine with a couple of joysticks and a bunch of buttons, but do consider any particular game favorites before you start building. The second software consideration that may alter planning is the operating system choice. This will primarily affect your interface decisions. Almost every interface option will function in a Microsoft Windows or MS-DOS (or MS-DOS-compatible) environment. If you’re planning to use Linux or a Mac, however, then you’ll need to investigate the interface’s requirements before you proceed. Also bear in mind that more computer games are written for the Windows platform than any other. Arcade cabinets have been made with both Linux- and Macintosh-based systems, but unless you have a specific reason to do otherwise, running a Microsoft operating system will be your best (easiest) choice. My recommendations have nothing to do with the capabilities of Linux and Macintosh. I’m a big Linux fan, using it both personally and professionally. I also have a lot of respect for the Macintosh and its capabilities. Please don’t flood me with e-mail pointing out the error of my ways regarding my operating system choice. Constructive criticism is, of course, welcome! Now is the time to decide how much you’re willing to spend on this project. This as much as anything else will determine what kind of project you’re able to build. Planning for the mother of all arcade machines on a limited budget may be an exercise in frustration. However, with some careful thinking, you can lay the infrastructure for your dream machine and build it up slowly. A two-player panel now can be swapped out for a four-player panel later, when you have the financing to buy all the required parts. A low-end computer can be upgraded to a high-end computer later. About the only choice that’s not alterable is the physical construction of the cabinet. For instance, you might only be able to justify buying a 19-inch monitor at the start, but have a 25-inch monitor in mind down the road. In that case, be sure to build the cabinet wide enough to support the larger monitor later! A goal without a plan is but a dream. A plan is only as solid as the paper it’s committed to. Now that we’ve hit the end of the chapter, take the time to write down any thoughts and decisions you’ve made. Be sure to keep references noted as well, such as page numbers or Web site addresses for later referral. This may save you frustration in the long run. Continue this habit as you proceed through construction. As a side note, near and dear to my heart is the creation of Web sites. If you know about creating Web sites, or even think you might want to learn, consider keeping a construction diary. Take plenty of pictures as you go and accurate notes. This will not only help you if you need to refer back for any reason, but, if you put it up on a Web site, might just also be the inspiration for the next person who decides to build his or her own arcade machine! Start a separate sheet of paper devoted to your budget. Keep track of every single expense so you can keep an eye on the bottom line. It’s amazing how quickly those “quick trips to the hardware store for a few screws” can start to add up. Of course, if you’re hoping to hide the evidence from a spouse, this step is not recommended! You have a lot of choices ahead of you, all of which lead to guaranteed fun! An upright, cocktail, or countertop arcade cabinet will make a great addition to a family room or game room. If space is at a premium, you might choose a desktop arcade controller. Whichever you decide upon, proper planning will help ensure success. Whether you choose to build an arcade cabinet or a desktop controller, or buy your way to gaming fun, this book will guide you along the way! Speaking of plans, that’s just one of the things I’ll cover in the next chapter, where you get to jump right in and start building your arcade cabinet. The magic’s starting, so let’s go! Copyright © 2004 Wiley Publishing, Inc.